I just finished reading Manning Marable’s biography of Malcolm X. Let’s address the controversial claims that it made, the key ideas it contained, and also some of the fascinating coincidences that it brought to light. Malcolm X, like Martin Luther King, was assassinated at the age of 39, that is, on the eve of turning 40, the age at which, in African society, one becomes an elder and attains the highest wisdom. Powerful and influential as they were, they were cruelly snatched away from us before they had actually reached their full potential. Today, the building where Malcolm was killed, The Audobon Ballroom, on Broadway in New York, has been made into a museum to honor both King and Malcolm. Guess what the number of the building is? 3940! Malcolm, many thought, would one day succeed Elijah Muhammad as the head of the Nation of Islam. However, he did not. Elijah’s son, Wallace Deen Muhammad, would succeed him. Malcolm was the seventh child born in his family, likewise Wallace was the seventh child in his. Malcolm headed the mosque in Harlem, Muslim Mosque No. 7. Louis Farrakhan succeeded him as leader of Mosque No. 7. Malcolm broke away from Elijah and, at the time, Farrakhan criticized for doing so. However, years later, after Wallace came to power as Elijah’s successor, Farrakhan would follow suit and leave the Nation, and like Malcolm, he too would set up his own, independent Muslim organization. When Malcolm was a child his house was set on fire, and his parents barely got all the children out safely. His father would later falsely be accused of setting the fire. Towards the end of his life, Malcolm’s house was set on fire and he and his wife, Sister Betty, barely got the children out safely. He was later, like his father, falsely accused of setting the fire. Both Malcolm and his father died violent mysterious deaths, and white reactionaries were strongly expected to have been behind both kilings. Malcolm died just as his the book he wrote about his life was coming out. 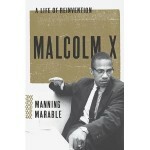 Manning Marable died just as the book he wrote about Malcolm was hitting the stands. I was not at all surprised that the book proved controversial. The essence of Malcolm was controversy. Everything he did. Everything he said. Everything he espoused. Everything he stood for was controversial in America, from the moment he said them, right up until today. Marable, however, seemed to court even more controversy by speculating about sexual issues. Free speech allows him to do so. But all that he presented in that regard was pure speculation. What else could it be? One can never know what a person does, or does not do, behind closed doors unless one is in the room with them. Furthermore, those issues were only a few pages in a 600 page book, so I paid them little attention. What I take fault with in the book is where, a number of times, the writer says that Malcolm was in error in some political action or stand that he took. He would have been better served by sticking with the facts and leaving out his editorializing or putting them in a separate section toward the end of the book. What really engaged me was his recounting of the tumultuous events in America in the sixties. It was a time when bold, completely fearless young leaders rose to commanding heights and courted death and never flinched, and so many ultimately paid the price. Martin Luther King, Medgar Evers, Malcolm X, John F. Kennedy, Robert F. Kennedy, just to name a few. What we witnessed in the 60s can literally be described as the “Death of Charisma.” Powerful, mesmerizing figures of stupendous oratorical talent and incandescent personal magnetism ruled the airwaves and one by one they were cut down. All of that was 40, 50 years ago, and still their shadows loom larger than any others in our collective memory, as we wander in a wilderness led by false prophets and manufactured political personalities benumbed by a stupendously engaging media spouting hypnotic trash. Books like this one, with its flaws and all, are to be applauded. They engage our minds as they ignite spirited debate and the exchange of ideas rooted in our researching, re-reading, and ultimately reinterpreting, of our own history in what will hopefully be an endless give-and-take. The term “revisionist history” is a common one. But all history is revisionist. No one has absolute claim to the truth. Not Alex Haley. Not Manning Marable. No one. Doubtless, some young person who reads this book will write an even more comprehensive retelling of Malcolm’s life, only to be eclipsed still yet by another writer perhaps as yet unborn, and on and on. Malcolm X brought Islam into the American consciousness. Malcolm X spawned the Black Power movement. Malcolm X was the first to call for Black Studies. Malcolm X took the struggle for Black equality onto the international stage. Malcolm X was a hero of truly epic proportions. Malcolm X, and Muhammad Ali, were at the cutting edge of our embracing of our African heritage and our taking pride in calling ourselves Black. Another thing that struck in reading this book is how so often, throughout history, movements aimed at toppling the status quo, not just here in America, but around the world, often end up becoming involved in bitter internal feuds. And outside forces, the powers that be, manipulate these feuds toward deadly ends. And so there was Malcolm dealing with internal and external threats to his very life, soldiering on relentlessly. Traveling far and wide, all across the world and here at home, under constant unremitting, deadly danger but continuously, uninterruptedly, passionately, eloquently analyzing our condition and the challenges we face without any thought whatsoever to the perils he faced. He knew his days were numbered. But he also knew that the things he wrote and the things he said would live on as guides and markers for us today, now and forever. . .